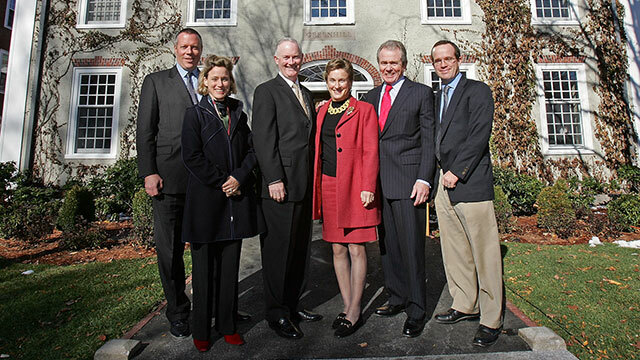 Greenhill House is named in honor of Gayle and Robert F. Greenhill (MBA 1962). 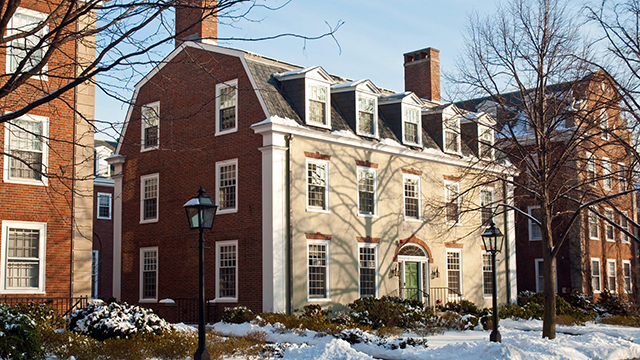 Greenhill House (formerly Humphrey House) was renovated in 2004 and rededicated to honor a distinguished family with close, multigenerational ties to HBS. The three-story, stucco and brick office building was designed in the Georgian Revival-style by McKim, Mead & White as part of the original 1920s campus plan, though construction was delayed for financial reasons until 1965, during the tenure of Dean George P. Baker. Currently the building provides administrative space for the Global Initiative, which was launched in 1996 to deepen the School’s long-standing focus on international course development and research by facilitating closer ties with companies, academic institutions, and alumni worldwide. Global Initiative staff—in tandem with colleagues at HBS research centers around the world—assist faculty, students, and alumni in their work, encouraging a global outlook in research, study, and practice. Greenhill House was named originally for George M. Humphrey (1890-1970), US treasury secretary under President Dwight D. Eisenhower from 1953 to 1957. An attorney from Michigan, Humphrey became a leader in the American steel industry as the president of the M.A. Hanna Company and consulted with the US government on industrial initiatives in post-World War II Germany. In his role at the Treasury, Humphrey was an enthusiastic advocate of a free market economy and the reduction of federal deficits. To honor Humphrey, the George M. Humphrey Fellowship was established at the School to support an MBA student. Robert Greenhill (MBA 1962) is chairman of Greenhill & Co., LLC, an international merchant-banking firm he founded in 1996. Headquartered in New York, the firm has offices in key financial centers around the world. Greenhill launched his venture after more than 30 years on Wall Street, where he established his credentials as a preeminent investment banker and helped shape some of the world’s most successful corporations. During most of that time, he worked at Morgan Stanley, where he founded the first M&A department in the industry, headed the investment banking division, and rose to the rank of president. In 1993, Greenhill became chairman and CEO of Smith Barney. 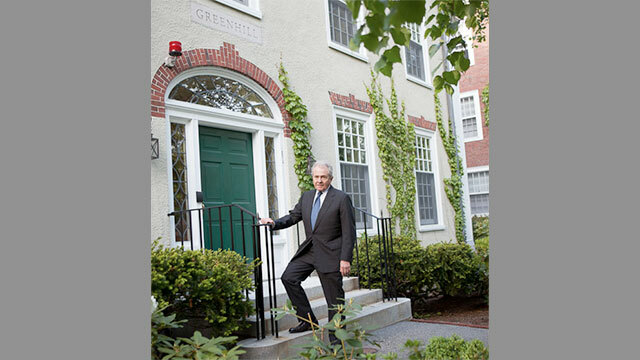 Greenhill’s many contributions to HBS include service on the School’s Visiting Committee and Centennial Global Business Summit Steering Committee, as well as leading roles in reunion fundraising. In addition to the family’s support for global research, in 1987 Greenhill endowed the Robert F. Greenhill Award, given annually by the Dean to members of the HBS community who contribute to the School in significant ways. 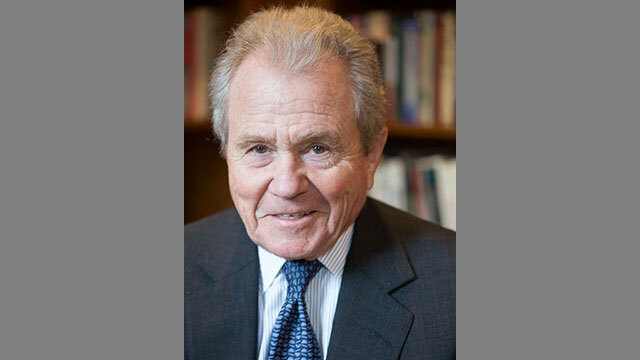 In 2009, Greenhill received the School’s Alumni Achievement Award in recognition of his service to HBS. The award is given to alums who have contributed significantly to their companies and communities. All three of the Greenhills’ children and their spouses are HBS graduates: Sarah Greenhill Wildasin and her husband, James Wildasin (both MBA 1989); Robert F. Greenhill Jr. and his wife, Sarah Bodman Greenhill (both MBA 1995); and Mary Greenhill Cagliero and her husband, Massimiliano Cagliero (both MBA 1997).